From Pampers to Cloth Diapers at The Great Cloth Diaper Change! "You’d think that since I’ve been cloth diapering since 2009 I would have attended the Great Cloth Diaper Change. Sadly, that’s not the case. This was my first year and let me tell you it was fun and exciting! It’s always amazed me how passionate those of us fluff lovers are about out fluffy little bottom holders. We both looked at each other and said, “Yeah, it looks fine. 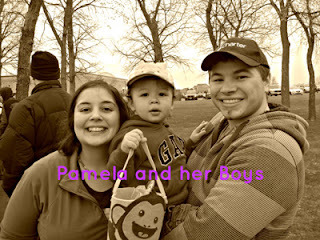 Why?” Pam then told us that she came to the event with her son in Pampers with two cloth diapers in hand! Those two diapers were the only ones her little boy’s bum had ever touched…and it all happened at the Great Cloth Diaper Change 2012! If that doesn’t give you a little picture what the Change is all about, well, I don’t know what else could aside from 100 parents doing the same thing with their children at the event. Hearing Pam’s say that this was her first time changing a cloth diaper I just had to get the inside scoop from her. 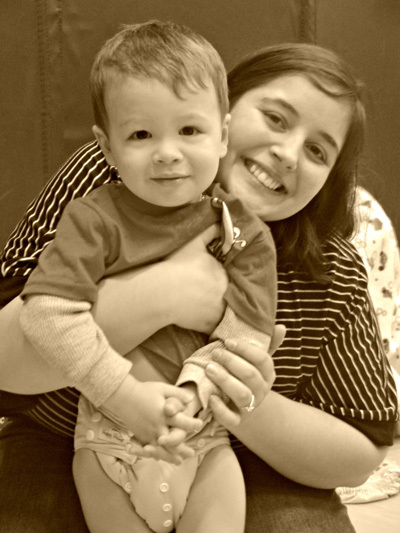 Read on to hear her story and why she’s chosen to use cloth diapers going forward!" Pam: I'm Pamela, but you can call me Pam. My amazing husband of 4.5 years is Luke and our little guy is Christopher (he will be 2 on 4/28!!). Our 4w3d old new addition (or additions, my beta numbers were on the Twins range and I have been having earlier and stronger symptoms than with my first; I found out I was pregnant at 3w0d with a digital test!!!) doesn't have a name yet. Actually no one knows, apart from some random strangers and the people that were at GCDC (we needed to get it out... we have been waiting too long to tell people... lol. FTM: What brought you to the GCDC? Where did you hear about it? Pam: I just thought it would be a fun event and knew that it would have enough people there to show me how to handle the two cloth diapers I owned. I didn't know how many inserts and which ones to use. I've heard about the GCDC online. I actually have been reading and posting on cloth diaper FB pages since November of last year. FTM: What made you decide to start using cloth diapers? Pam: Well... this is going to be a long one. I wish I had an amazing "conversion" story but I don't. :/ - My child has no bleeding diaper rash from disposables... And I barely spent anything disposable diapering him (I take online surveys, get paid in Amazon gift cards, pay for the diapers with the Amazon gift cards.. ta-da! Free diapers for almost 2 years!). And on top of all that, I can say I am a pretty lazy stay-at-home-mom (SAHM). Dump poop in the toilet??? Wash extra loads of laundry? Not for me!! Disposables for me were free and convenient, however… Back in October of last year, I decided that I needed a decent baby/toddler carrier, since we were going to visit my parents in Brazil in January (oh! did I mention that I am from Brazil?). I was not going to take a stroller with; one more thing to carry on and my son doesn't like strollers anyways. But I moved on... Black Friday arrived and I got my Boba. Since my purchase was above a certain amount I got some freebies too! A CJ Butter stick (loooove that stuff!!! ), a pair of Babylegs, a huge wetbag and MY VERY FIRST CLOTH DIAPER! Nothing fancy but when I saw it I loved it. It was so cute, and soft, and fluffy! A week later, I get picked as one of the winners of a giveaway and my prize was... That's right! Another cloth diaper! A light green pocket diaper of the same brand as my first free diaper. Is that a sign for me to cloth diaper?? So my reason to switch to cloth was because I thought they were extremely adorable! Cuteness won me over, however, that wasn't the main reason. The main reason that I want to change from using disposables to using cloth diapers is that there is something about the Cloth Diapering Community that attracts me. I know, that sounds ridiculously funny, but it is true! The main reason that I am talking my husband into making the full change (well, he thinks it will save us money, since we will use the money for the disposable diapers to buy other stuff at Amazon) to cloth is that I want to be part of the community! Believe it or not, it amazes me that the cloth diaper community is one of the very few communities of moms (and dads!) that seems to get along! And everyone has so much passion for it! I still wonder how someone can LOVE washing stinky, poopy diapers as well as dealing with it. Every single person I know that cloth diapers has a passion for it and can talk about it all day and night! There is something there; and I want to be part of it! I want to make friends and talk about the cute fluff our kids are wearing!! FTM: What were your first impressions when you put the diaper on? She took me to a changing table. I gave her my diapers and in like half a second she stuffed them. I was shocked! So I put it on my son and she said I did it correctly. I just told her to promise me it wouldn't leak and she assured me it would be fine. (I had no extra clothes along with us!) My son played around in the diaper from about 9:30am until the time of the change (11:30am) and there were no leaks!!! Then the GCDC came and it was the true test! I was all alone... well, somewhat alone. Me, my son, and a bunch of people that knew what they were doing. But I had to do it on my own... And I did it! And the first thing I though was, “Awwwwwwwww your bum looks so cute!!! !” And then I looked at you [FTM] and asked if I did it right. We came home and there were no leaks!! I was so surprised that I kept touching the diaper. The inside of it was wet but the outside was dry!!! I think I am starting to get hooked! At the end of the day, I even caught myself defending cloth diapers. My husband is a little unsure, since he saw a few of the young kids walking with their legs open wide and little infants with big bubble butts at the GCDC. I told him was that our son used to walk like that when he was their age (diaper or no diaper, kids walk funny when they are just learning and hubby forgot that). I also told him that their butts are just as big as the type of diaper they were using and the amount of inserts that were stuffed into the diaper. Then I explained that there are all-in-ones (AIOs), which can be trimmer, or you can also use Newborn diapers instead of a one-size in order to avoid most of the bulk. A few minutes later I was laughing at myself! I didn't know how defensive I could get over something I started using that day! I was defending cloth diapers even though my experience with them had only been a few hours long! I want them to work; I want them to work so bad! And I want to convince my husband that they will work for our family. We will be taking the next class at the host store for our GCDC together. I want to be with him so we can learn together how to chose, care and enjoy the fluff. Then I can get the green light to start adding more fluff to my small but beloved two diaper stash.